Yep, it's the return of everyone's favorite topic: decoding! What's going on in Rivertown? What are we getting for 2017? Speculate away! This has been created as a new thread in the Kings Island section to replace the "Project 2017?" thread under Rumors, since it appears to no longer be a rumor or question. No trespassing. Yes, there was an incident three years ago when the Decoding thread was temporarily shut down due to a (now-banned) user who trespassed in the construction area. Suffice it to say that Don was mad. Don't do it again. Along those same lines, no posting of any illegally obtained photos/videos, whether yours or someone else's. This means not just anything obtained by violating the law, but park rules as well. Be nice. This should already be covered by the TOS, but the last Decoding thread featured a number of arguments (mainly between two specific coaster manufacturers) that occasionally got out of hand. Let's try to avoid that on this go-around. Speaking of the TOS (Terms of Service), those can be found at http://www.KICentral.com/forums/index.php/topic/4128-terms-of-service/ (the persistent link at the top or bottom of the forums, depending on which skin you use, doesn't work). Above all, use common sense. If something doesn't feel right, perhaps you're better off not posting it. I recommend that you read the Terms of Service (linked above) in their entirety before posting. It's a fairly quick read, and it's always a good idea to be familiar with the rules of an unfamiliar website before using it. "Those who speak do not know. Those who know do not speak." In other words, those who really know what's going on (which does NOT include seasonal employees) aren't going to be leaking information (more than likely, their lips are sealed by a non-disclosure agreement), and those who claim to have information are almost certainly making it up. Be aware that this community has a history of being largely self-moderating, so if you violate the TOS, your mistake is just as likely to be pointed out to you by a regular user as an admin/moderator. Understand that they're usually just trying to help you learn the ropes and that they don't have a vendetta against you; just say thanks and learn from the mistake so you don't do it again. Plenty of users have started here on a bumpy road and gone on to become active, respected users. Also, one mistake, or even a few mistakes, are highly unlikely to lead to a ban. User bans are fairly rare here. Lastly, know that Kings Island park officials do read these forums, including PR director Don Helbig. Don occasionally posts on KIC as "DonKIPR", though I wouldn't expect him to post in this thread. Regardless, don't be surprised if a social media post by the park indirectly references the discussion here. Notably, at one point in the original Decoding thread, somebody commented that Don could tweet something about apples and we'd take it as a clue of some kind, and about an hour later, he did exactly that! I am proud to say I am the second post of a new era of Starting to Decode! Let the speculation and decoding begin! I added a few links to the first post, including the original Starting to Decode 2014 thread. Hmm...the falling trees thing has me thinking along the same lines as Jcgoble in the other thread. I'm gonna have to guess this is either a wooden coaster of some sort or a new log flume/water ride. Other possible options I would not rule out include a new set of Antique Cars in the woods but I don't know how that fits the sign...or perhaps that's the point of the sign...or a new dark ride. I don't think the location would work well for a Giga Coaster (not enough room and right next to Diamondback- there are other, far better spots for such a huge coaster at Kings Island IMO) so I don't think that is what it could be. A Blitz-style coaster from Mack rides could also fit there though. Could falling trees just mean s something indeed is being added in that spot in the future? Maybe it's our Dark Ride. Well, first, you can tell Goble is a big Star Wars fan. Called it in the discussion thread a little earlier. Over 100 pages of folks speculating, guessing, knowing (from their inside source), Bickering, bunch a new people. Some people getting banned. Sure is gonna be fun! So where's the green Intamin track being stored? 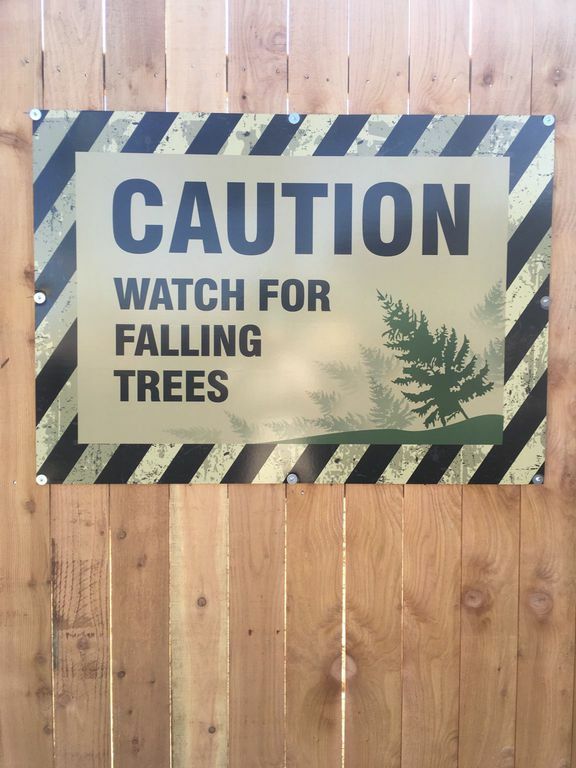 I'm thinking an RMC hybrid because of the falling trees signage- it could try to be billed as a "wooden" coaster It could also be very possible that it is an actual wooden coaster. And thanks Goble for starting this thread; happy speculatin'! EDIT: I forgot to mention I also thought of Camp Snoopy when I saw the picture of the signs because of the proximity to Planet Snoopy. I was wondering how many pages it would take for that to be mentioned. Honestly I was surprised it hasn't been already! Just saw it. I knew in my back of my head that there would be something happening there due to the move of the funnel cake station. Very excited! Maybe they're just giving us some very sound advice. Cedar Fair won't go with RMC. 1.They don't have the perfect safety record that GCI has. 2.They haven't dealt with them. I'm pumped. I believe this to be a coaster given how early this is. I really really want a new wood coaster. If it is a wooden coaster it will be unmistakable. There won't be large footers They'll be many, many little pilings in rows forming a line. I was actually about to say just that...I agree with KI Guy there- if this is a wooden ANYTHING (RMC, GCI, GG, CCI back from the dead somehow, etc.) there will be lots and lots of footers. BTW I am also firmly on Team Wood Coaster (the option I WANT most). It'll probably be a GCI too since this is Cedar Fair and they are the go-to for them when it comes to wooden coasters if that is the case. I knew Banshee was a B&M as soon as the station footers were poured. Kinda curious, we will know if it's a coaster and what kind, when footers are started to be poured. My question is, is the train open today? ^I see KI&MVRR running on the webcam. I'm going to repeat what was said above, Do not trust pass, dumb idea and an easy way to get banned and kicked out of KI! This was definitely a surprise. But we knew there had to be a reason for moving WWC's entrance. Unless I'm mistaken or something has been changed, I believe guests are allowed to take photos on the train. If someone needs to correct me, now would be a good time for future reference. Also, if that is the case, I imagine Don is now furiously finding wood for a 2nd fence between the train and ground zero. Is it against the rules to take a pic through the holes? I've never been to KI so forgive me. Where is this fence? Is it blocking a large enough area for it to be some sort of coaster? I'm leaning towards a dark ride with VR technology since Cedar Fair has said that they are looking at combining VR and a dark ride. It is near the train tracks where the WWC entrance used to be. In between the train and Race For Your Life.